IMG_1007, originally uploaded by All Things Mimi. 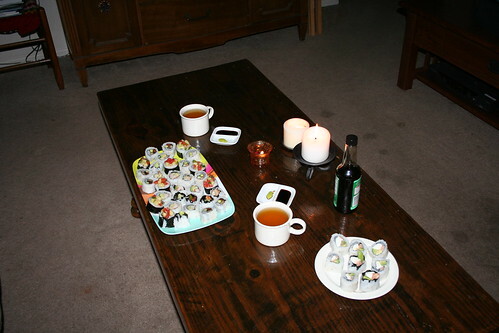 What insights do I have to share after surviving my first at home sushi experience? My rice was too sweet, and the rolls were too ricey. Next time I won't use all the seasoning mixture. I will also use a little less rice on the nori. Oh- and I didn't get a pic of one of my favorite rolls- the Veggie Roll. I used roasted portabello, tomato and asparugus. It tasted great and was really pretty, too! I will definitely do this again, only I will make less rice. 2 cups of sushi rice made 5 rolls. Dev and I couldn't eat it all. I am taking about a roll and a half of leftovers to school tomorrow. I may attempt to do some crunchy shrimp rolls next time. And maybe I'll even work my way up to a tempura roll.